We’re typically the first in line when it comes to checking out the newest and hottest bars, but our pants would catch fire if we tried to suggest we didn’t also enjoy old-school pub atmosphere. 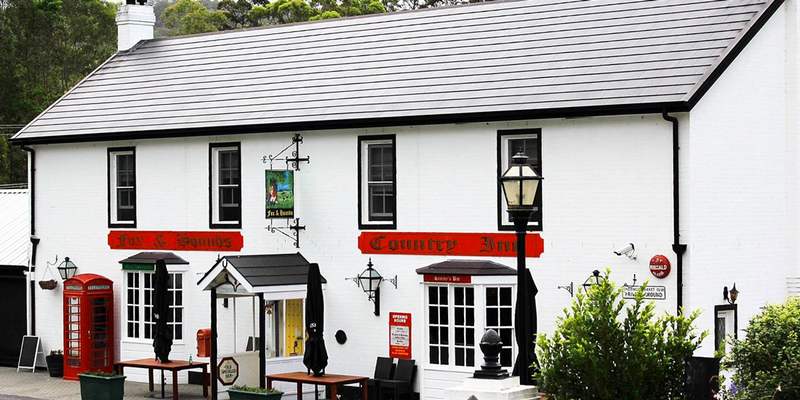 The country pub is an Australian institution – pillars of the community that provide ample cheer to go with its cold beer. 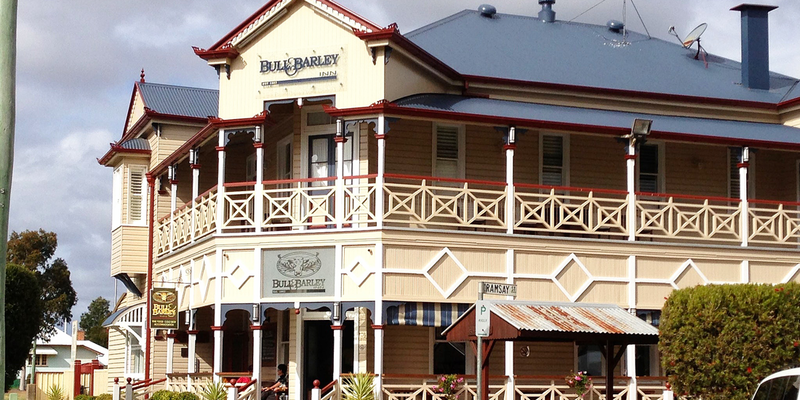 Southeast Queensland has a stack of history-laden pubs that are well worth experiencing, and we’ve whittled down the list to a tight five to check out the next time you’re itching to hit the road and explore. The first pit-stop on our tour of historic pubs takes us past Noosa to Boreen Point on the shores of Lake Cootharaba. The Apollonian Hotel is a landmark location that has been drawing in punters since the days of the Gympie Gold Rush. Retaining the charm of its original colonial-era past, the building boasts cool verandas and sprawling lawns. Those that make the drive north can refuel at the Apollonian Hotel’s bistro, which serves up a stellar array of pub grub, from chicken parmigiana, beef lasagne, beer-battered flathead, Thai-spiced salmon and the signature Apo Steak Burger. If you visit on a Sunday, you can treat yourself to the hotel’s popular Sunday spit roast. On the outskirts of Toowoomba sits Cambooya, a peaceful country town that is home to historic and popular taphouse Bull & Barley Inn. Originally built in 1902, the inn has been lovingly restored to showcase the gorgeous grandeur of the building for future generations. Travellers stop in to spend an evening in the comfortable rooms or to dine at the on-site restaurant, which plates up sizeable country-style fare such as pan-roast chicken, crispy skin pork belly, schnitzels and hearty grilled steaks. Anyone exploring the Darling Downs should make a visit to this stunning landmark a priority. 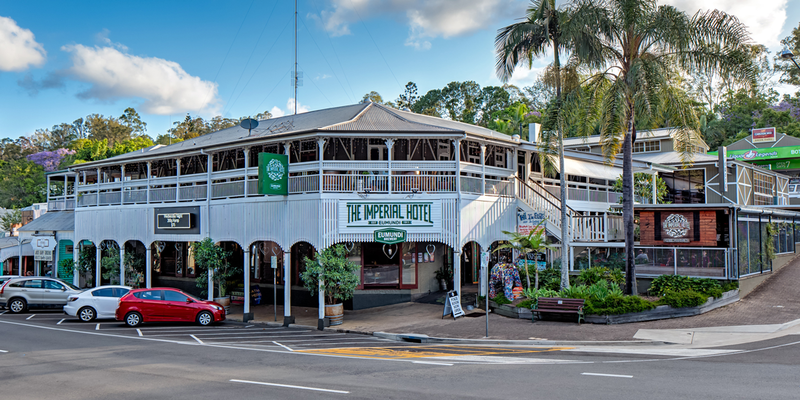 Another must-visit location in the Sunshine Coast hinterland is the Imperial Hotel in Eumundi, an iconic pub that has been pouring perfect frothies since 1911. The stunning heritage-listed Queenslander facade houses a modern interior, featuring a bustling beer garden, several entertainment spaces and the storied Eumundi Brewery, which is responsible for crafting a range of beloved beers. Brewery and tasting tours are up for grabs, and the Imperial Hotel also draws in the crowds for regular live music nights. Few countries do the humble country pub better than the Brits, and Fox & Hounds Country Inn is a beautiful and authentic spot that offers the best parts of traditional English hospitality. The Wongawallan icon is the only pub in Australia to have been transported from England, with a crisp white exterior shining like a beacon in the lush surrounds and an interior flush with antiques. Fox & Hounds two bars – George’s Bar and Paddy’s Bar – are stocked with British ales and Guinness on tap, as well as fare such as Toad in the Hole, Lancashire vegetable hotpot, traditional pork pies, classic Cornish pasties, lambs fry, and bangers and mash. The final stop on our list is the furthest away, but it’s one that boasts the most history. 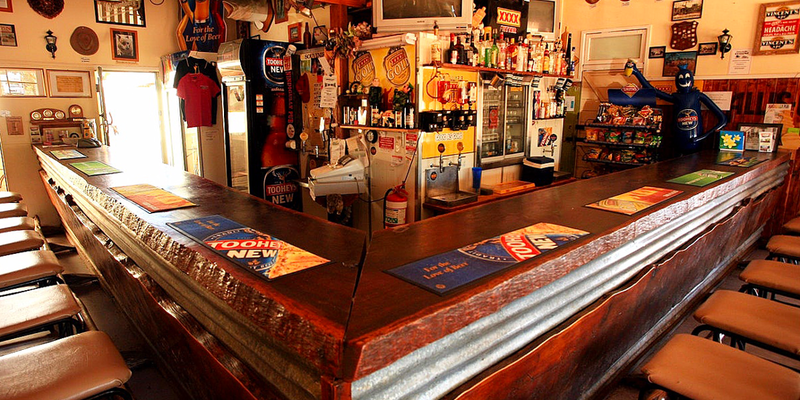 The Nindigully Pub was first licensed in 1864, making it Queensland’s oldest hotel and pub. The building started its life as a shearer’s accommodation before being converted into the long-standing hospitality destination. Although Nindigully itself only boasts a population of nine folks, it brings in a steady stream of locals from nearby townships and travellers from across the state. The kitchen is renowned for serving the biggest burger you’ve ever seen, and the kilogram t-bone steaks also make for a formidable feast. Rooms are available, but caravans and campers can park for the night alongside the hotel and the banks of the Moonie River, with showers and toilets freely available. Be sure to plan your visit around the popular Nindigully Pig Races and annual country music festival.